Work-at-home space is a necessity for many homeowners, but it's often carved from rooms that were meant for other things. 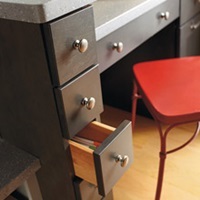 By using cabinetry as furniture, you can create an office space that works, whether it's in a remodeled den, part of a bedroom or a repurposed corner of your kitchen. Here are some ways to put office storage cabinets to work for you. You don’t need to have a formal office to have an office file drawer. 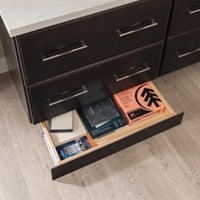 Add base cabinets specially designed for file folders, anywhere from the kitchen to the bedroom or family room, and no one will be the wiser. Vary office cabinet heights to create visual interest and the look of fine furniture. Add crown moulding to wall cabinets and shelving units to create an organized office that complements your home’s décor. Hang a pair of wall cabinets with aluminum frame vertical-lift doors and frosted glass inserts above a credenza made out of two-drawer base cabinets: Voila! Instant office organization. Create a cozy kitchen workspace by combining several office organization cabinets: wall cabinets with open shelves; a row of spice drawers for storing small items like paper clips and pens; base cabinets with drawers, and a countertop with space below for a desk chair. One of the easiest ways to add storage, open shelving creates space for keeping books and other items, along with display space for art or collectibles. Showcase your items even more by adding lighting to the open shelving. Convert a countertop into a workspace with a Sensio PowerPod, a device with electrical outlets and USB ports that pops up when needed and disappears from sight when not in use. 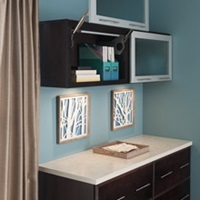 Install in a home office, kitchen, garage or any other room with a countertop or hard surface that has an 18-inch vertical clearance above and below. 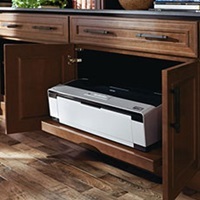 A base cabinet with a roll out tray creates housing for a computer printer, for convenience without the clutter. 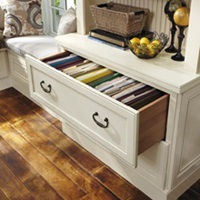 Adding a toe-kick drawer to a base cabinet creates storage space where there was none above a non-carpeted floor. Perfect for stashing printer paper, legal pads, pencils and appointment books.